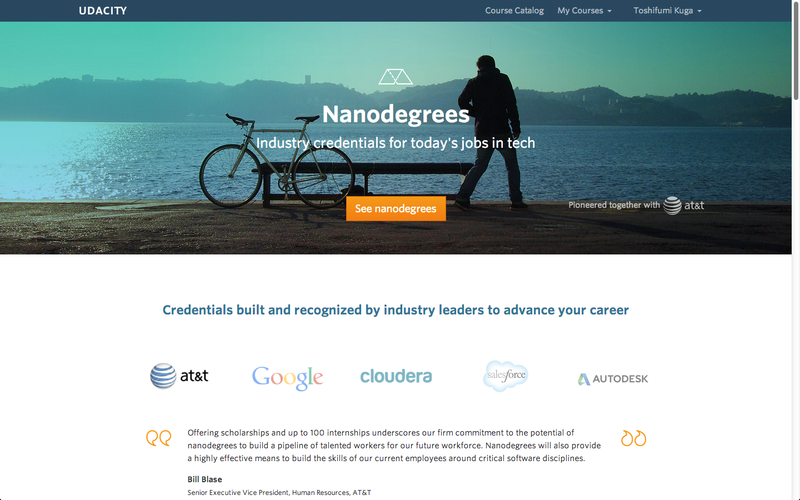 I have started Nanodegrees in Udacity this week. Yes, I will develop my website by myself! I have started Front-End web developer course of Nanodegrees in Udacity this week. I would like to obtain the skills of front-end web development, such as a website and mobile service because I would like to develop websites and mobile services, which are backed by machine learning. So I am going to set up the prototype website on Microsoft Azure and use visual studio online for writing codes of HTML, CSS and Java script. When I learn methods to write the codes in Nanodegrees, I try to use these methods to develop the prototype website on Microsoft Azure. I think it is good because I can learn the methods of wiring codes through Nanodegrees and develop my websites on Microsoft Azure at the same time. As I said before, Nonodegrees focus on industries practices and applications for jobs. It looks like an open training on the job. It introduces a project based method, where participants should make several web sites by themselves according to instructions. I hope I can develop websites by writing HTML, CSS and Java script by the end of this course. Actually, it is my first online course, which is required to pay for. It costs 200 USD per month. I took more than 10 MOOCs (massive open online courses) in Coursera and Edex before. Unlike Nanodegrees, these courses are free so I do not pay any fee at all. Most courses in Coursera and an Edex are provided by professors of the universities. So Nanodegrees are contrasted to Coursera and Edex, which are major providers of MOOCs. I would like to explain what the difference is between Nanodegrees and other free courses going forward. I want to make it a kind of parallel processing to develop websites and mobile services. When new methods of developing of websites and mobile services are provided through Nanodegrees, I will deploy prototype websites on Microsoft Azure at the same time. In addition to that, the project to develop recommender engines is going on in my company and the prototype engine will be expected to be developed within this year. This engine will be combined with the websites to enhance their services. I think it might be possible as Microsoft Azure has machine learning as a service. This is a scheme to set up the platform to develop websites and mobile service backed by machine learning. Front-end developer course of Nanodegrees in Udacity might make it possible even for beginners like me. I hope this program keeps a high standard to provide skills and methods to participants so that everyone thinks it is worth paying fees to participate in this course. I am sure Sebastian Thrun, CEO and cofounder of Udacity makes it happen.